The final level purification of the water circulating in the system is high enough for using it again and again. 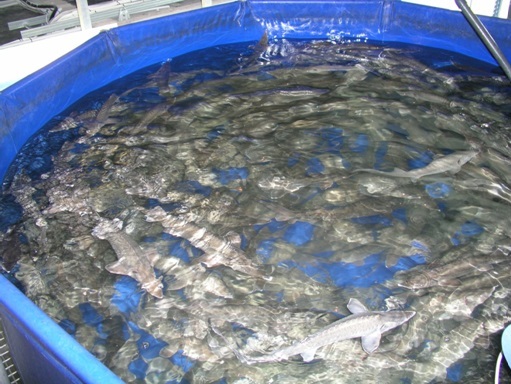 RAS has 2 rectangular shape fish tanks (11 m x 4.25 m & 9.75 m x 4.25 m) and 12 round fish tanks Ø3.2 m located in the cold temperature part of the farm. All the fish tanks have bottom sinks for the purpose of removing feces and unconsumed food from them. Bottom sink is Ø200 mm pipe installed in the bottom of the fish tanks. 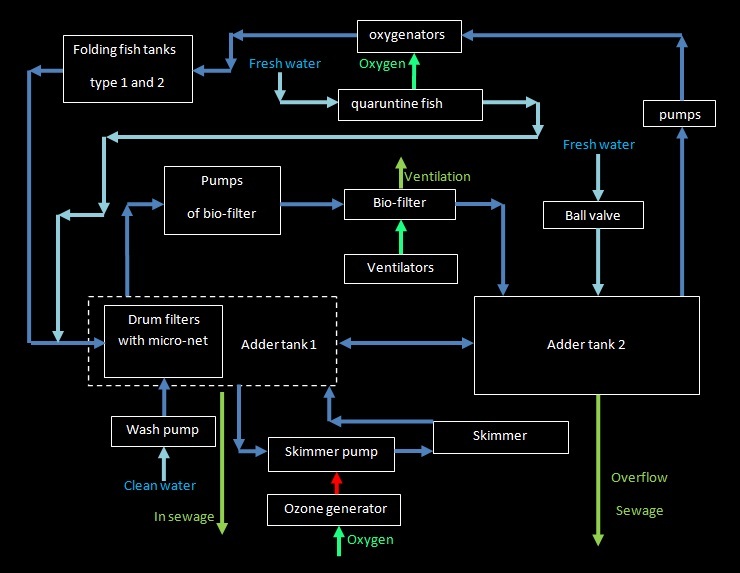 All fish tank sinks are connected into one sewage collector leading to mechanical drum filters. This collector is done as concrete chute in the floor. RAS has 2 adder tanks that are designed as cumulative and feeding (supplying) tanks and also mixing water circulating in the system. Two adder tanks are connected to each other by Ø315 mm pipe in order to keep water in them on the same level. Water from the fish tanks goes to mechanical drum filters by a sewage collector made in concrete floor. The drum filters equipped by 60 micron net each that thoroughly cleans water from any suspended substances. Water previously cleaned in the drum filters is coming to the adder tank 1. Further the water from the adder tank 1 is pumped to the bio-filter by 2 main pumps with a capacity 400 m³ per hour (800 m³ in total). The bio-filter is installed right above the adder tank 2. Going through the bio-filter where oxidation of organic nitrogen compounds to nitrate and oxygen saturation take place, as well as CO₂ removal then the water re-enters the adder tank 2. Water from the adder tank 1 is pumped by two pumps with the capacity 64.1 m³ per hour each (128.2 m³ per hour in total) and coming to the skimmer, and then re-enters the adder tank 1 again. Water from the adder tank 2 is pumped into the cone oxygenators by 2 pumps with the capacity of 300 m³ per hour each (600 m³ per hour in total), where it is being oxygenated to the level higher than atmospheric air, and then it enters the main tanks with fish. 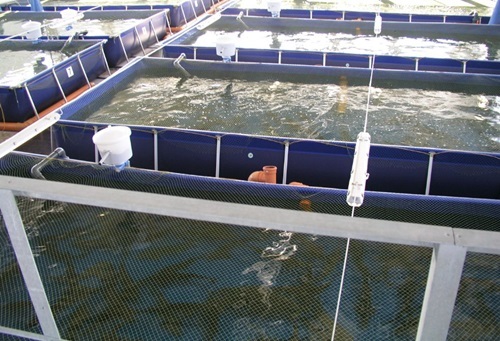 In case of failure of one of the pumps it’s necessary to stop feeding the fish and quickly move all the fish from the tanks connected to the broken pump into another row of fish tanks. Then urgent actions to repair the broken pump must be taken. The farm has 2 different parts: the main one with 10 rectangular fish tanks where the fish is living the most of time and a smaller low-temperature part with 12 round fish tanks where females are kept for graziery (during the time they are ready for producing caviar). Both parts of the farm have similar technical systems and schematic diagram.